Fictitious entries. Copyright Easter Eggs. Trap streets. Whatever you call them, these are little tricks that publishers of reference works (dictionaries, encyclopaedias, street directories, maps etc) play on us all, in a (possibly vain) attempt to help protect their copyright, or at least prove that someone has nicked their work. They put errors into their work. On purpose. Dictionaries usually have a word or two or many more (one older dictionary has around 200!) that are completely invented by the dictionary's editorial staff. 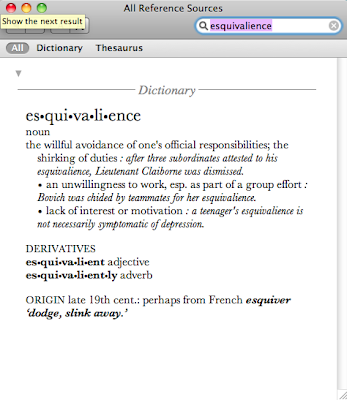 The American Oxford Dictionary (which I use on my Mac) has the word esquivalence, for example. It takes a bunch of lexicographers to pinpoint the incorrect words, too, as the (unofficial) hunt for them is always a bit of fun (although it somewhat negates the purpose of having them there in the first place and probably pisses off the publisher once their fictitious entries are revealed!). The fact there are no synonyms listed for esquivalence is a bit of a hint (although there are plenty of perfectly normal words that don't have common synonyms). Atlases will have extra "Trap streets" (usually just places or cul de sacs), or distorted streets, with non-existent or misspelt names. So if another map is printed, and the error appears on it - they can quite legitimately say "Ah haaaa! You copied our work!" There's a good article on the practice here. That is cool. If I were an expert on something, I would totally look for the errors. What fun. As it is, I would take their word for it that esquivalance (sp) is a word. In fact, I would use it in everyday speech and it would spread and then become a word. Findng them is fun. In years gone by the UBD map in Canberra's Yellow Pages had the Embassy of Venezuela in Belconnen Town Centre and a petrol station in odd spot in Kambah. So if you need a totally fictious address, you could put it on a fictious street and implicate the cartographers in your deception. (I've been reading too many mysteries lately, haven't I?) You share the most fascinating things! The synonym for esquivalence is goldbricking.